Purva-mimamsa, known as Mimamsa, lays great emphasis on ethics. The system holds that the Ultimate Reality, the world itself related to Karma. Karma is synonym of dharma. The contents of dharma are embodied in the Vedas. 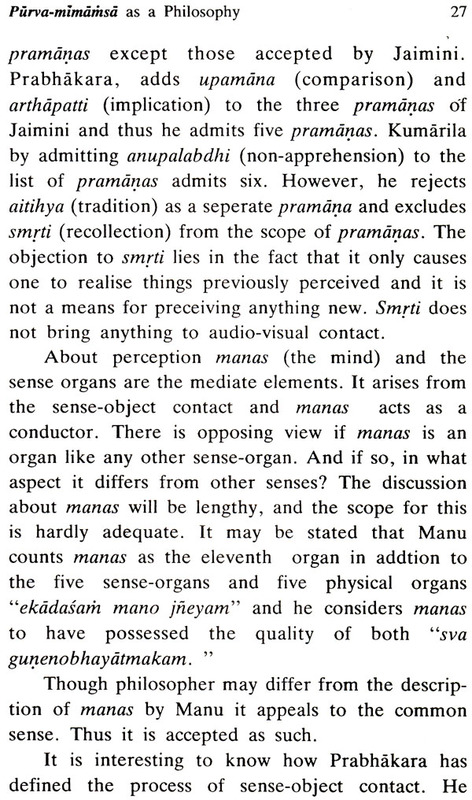 Mimamsa makes efforts to define dharma by correct interpretation of the injunctions contained in the Vedas. In this monograph the basic features of Mimamsa as a system of philosophy are stated with reference to other systems of philosophy. The conflict of Mimamsa with other systems of Philosophy including Buddhist is also brought out. Dr. Biswanarayan Shastri, a profound scholar who combines Sanskrit study and the inquisitiveness of modern research. His specialization in philosophy and Tantra matches well with his deep knowledge in ancient Indian history and archaeology. Dr. Shastri, a freedom fighter, statesman, educationist, research scholar and writer. His immortal creation Avinast (a historical novel in Sanskrit) earned him name and fame, which won awards by Sahitya Akademi, Bharatiya Bhasha Parishad, Uttar Pradesh Sanskrit Academy, Anundoram Barooah Institute, etc. He is President's awardee for his erudition in Sanskrit. He writes in four languages. The author is a former Member of Parliament (Loksabha). Presently Dr. Shastri is Vice-Chairman, State Planning Board, Assam. I have great pleasure to present this volume of Silver Jubilee Publication Series of the Rashtriya Sanskrit Sansthan to our esteemed readers. The Volume verily represents has all along been receiving from the distinguished scholars all over the country. The Sansthan was established in October, 1970 as an autonomous apex body under the Ministry of Human Resource Development, Govt. of India with view to promoting, preserving and propagating a Sanskrit learning in all its aspects, with special reference to the indepth Shastraic learning. Apart from conducting the regular courses of studies at the various constituent Vidyapeethas, it has been bringing out invaluable publications representing dissemination of knowledge contained in the Shastras. Thanks to the continued help, encouragement and support from the Ministry of Human Resource Development, Govt. of India that the Sansthan has grown by leaps and bounds and has been able to render its services to promotion of Sanskrit learning at national and international levels and is now completing its 25th year. It is quite in the fitness of things that the Sansthan decided to bring out 25 scholarly monographs in commomoration of its Silver Jubilee year. I express my deep sense of gratitude to Dr. Biswanarayan Shastri for his valuable services rendered in various capacities to Sansthan since its very inception. Dr. Shastri is one of the few scholars who has specialized in Mimamsa. Though he is very busy with his present assignment as Vice-Chairman of the state Planning Board of Assam, he readily accepted our invitation to write a monograph on Mimamsa on this auspicious occasion of Silver Jubilee celebration of Sansthan. My thanks are due to my collegues especially Dr. Savita Pathak and Dr. R. Devnathan who have been working vigourously for organizing the various academic programmes particularly Silver Jubilee Publication Series in a befitting manner. M/S Nag Publishers deserve our special thanks for bringing out this monograph within a very short notice enabling us to release the book in the valedictory function of the celebrations. The decision to publish a series of monographs on Sanskrit Literature and Philosophy on the occasion of Silver Jubilee celebration of the Rashtriya Sanskrit Sansthan is praiseworthy. I feel happy about the decision. Dr. Kamala Kant Mishra, Director, Rashtriya Sanskrit Sansthan, a man of imagination was kind enough to invite me to write a monograph on Mimamsa as a part of the scheme of publication. Though I was aware of my limitations for such a job I had to accept the assignment on consideration of my log association with the Sansthan, since its inception. In preparing the monograph the readability by the average educated readers remains always upper most in my mind. Being circumspect by this intricacies of Mimamsa system and its impact on the development of Indian philosophical thoughts have not dealt with to the extant as it expected. The work is informative in nature and simple in treatment. The monograph is divided into three parts, viz. the first part is introductory, a brief account of the Mimamsa-sutra of Jaimini and other literatures of the system. In the second part an attempt is made to present the basic features of Mimamsa Philosophy and certain concepts peculiar to that system; and its conflict with Nyaya, Buddhist and Jaina Philosophy. The third chapter is a description of Kumarila Bhatta, the vigorous exponant of Vedic rites through Mimamsa and his contemporaries. I have consulted almost all the important original works on Purva-mimamsa and modern works. I have freely drawn from the works of Dr. Radhakrishnan, Dr. S. N. Dasgupta, Prof. Hiriyana, Prof. P. S. Sharma, Dr. Ganganath Jha, and acknowledge my indebtedness to them. 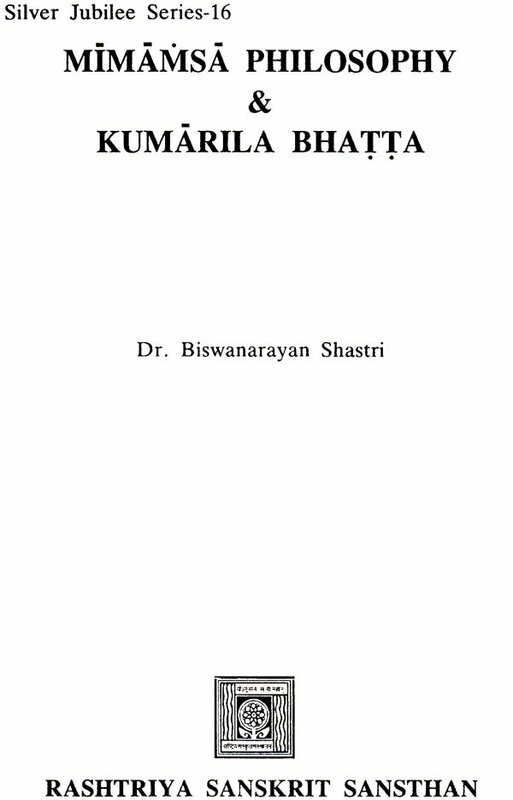 Prof. Sharma's work came handy in preparing a short anthology of Kumarila's works. I also express my gratefulness to the Rashtriya Sanskrit Sansthan and its Director for giving me this opportunity of presenting a monograph. Sri Gokulendra Narayan Deva Goswami, a young Lecturer in Sanskrit, helped me in preparing this monograph within a short time. I wish him success. I also bless Sri Kameswar Shukla for his help. I hope this monograph will be useful to the readers.